Exegesis on the piyyut “Kel Elokim Hashem Davar,” which is said on the 2nd night of Shavuot, authored by Rabbeinu Eliezer bar Natan Ashkenazi (the Ra’avan)—though there are those who dispute whether he in fact authored it. Two covers. Pritned by Rabbi Wolf Heidenheim and Baruch in Switzerland. With endorsement and boycott of Rabbi Pinchas HaLeviv Ish Horwitz, the HaHafla’ah. Printed by light green, thick, quality paper. 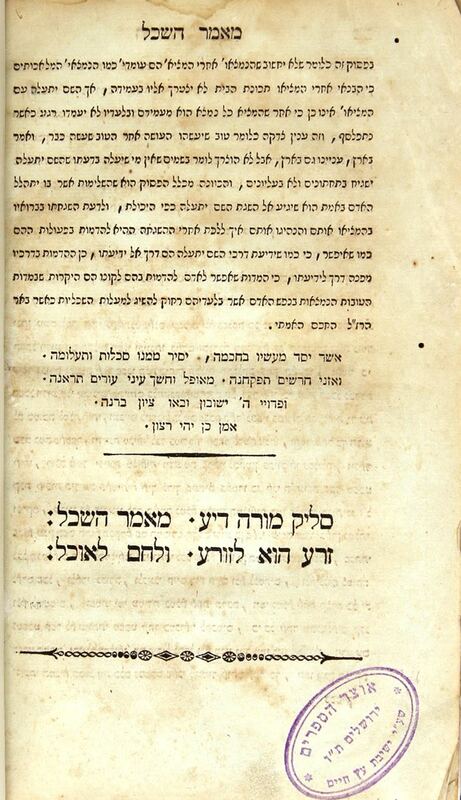 | Bound with Song of Songs and the commentary Ma’ayan MiBeit Hashem by Rav Yehiel bar Zerach (Johannesburg 1859). | Stamp of Rabbi Haim Berlin. Stains. New binding. | , 79;  62 pages. 20cm. Generally good condition.